Implementation of a inverse velocity kinematics algorithm based on the generalize pseudo inverse to calculate the velocity transformation from Cartesian to joint space of a general KDL::Chain. It uses a svd-calculation based on householders rotations. Definition at line 40 of file chainiksolvervel_pinv.hpp. 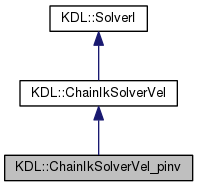 Definition at line 26 of file chainiksolvervel_pinv.cpp. Definition at line 57 of file chainiksolvervel_pinv.cpp. If E_SVD_FAILED returned, then getSvdResult() returns the error code from the SVD algorithm. Definition at line 62 of file chainiksolvervel_pinv.cpp. Definition at line 80 of file chainiksolvervel_pinv.hpp. Definition at line 87 of file chainiksolvervel_pinv.hpp. 0 if CartToJnt() not yet called, otherwise latest SVD result code. Definition at line 93 of file chainiksolvervel_pinv.hpp. if error is known then a description of error, otherwise "UNKNOWN ERROR"
Definition at line 132 of file chainiksolvervel_pinv.cpp. Definition at line 43 of file chainiksolvervel_pinv.cpp. Definition at line 101 of file chainiksolvervel_pinv.hpp. Definition at line 44 of file chainiksolvervel_pinv.hpp. Definition at line 110 of file chainiksolvervel_pinv.hpp. Definition at line 104 of file chainiksolvervel_pinv.hpp. Definition at line 102 of file chainiksolvervel_pinv.hpp. Definition at line 111 of file chainiksolvervel_pinv.hpp. Definition at line 103 of file chainiksolvervel_pinv.hpp. Definition at line 112 of file chainiksolvervel_pinv.hpp. Definition at line 107 of file chainiksolvervel_pinv.hpp. Definition at line 105 of file chainiksolvervel_pinv.hpp. Definition at line 113 of file chainiksolvervel_pinv.hpp. Definition at line 109 of file chainiksolvervel_pinv.hpp. Definition at line 106 of file chainiksolvervel_pinv.hpp. Definition at line 108 of file chainiksolvervel_pinv.hpp.